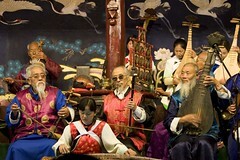 Lijijang's Naxi Orchestra is a piece of living history. 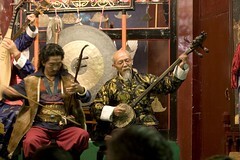 Not only are most of its members 90 in the shade, but they have survived the violent purges of Mao's ironically titled "Cultural Revolution" to preserve the musical heritage of one of China's ethnic groups, the Naxi. Enough of the tour book crap - these guys are amazing. Resplendent with flowing robes, flowing beards and barely one lot of 20/20 vision between them, they performed the strange, beautiful, occasionally discordant but always enjoyable traditional music with great dignity. 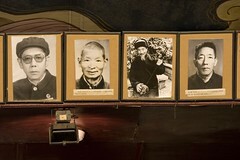 Their conductor Xuan Ke was a great character who himself spent more than 20 years in a labour camp, released at age 50. Fluent in English and Mandarin, he kept the crowd entertained with lengthy commentary between pieces. It's testimony to his humour and delivery that people remained attentive even when his monologues stretched to 15 mins. Many of the orchestra's older members took these opportunities for a quick nap. I don't blame them - with nightly performances, they've probably heard all the jokes before. A line of black and white portraits stretch across the top of the stage - a sad reminder of the musicians who have either died or who went missing during Mao's reign of terror. The only jarring note of the evening was the behaviour of quite a few members of the audience who not only left their mobile phones on but took calls and conducted long phone conversations during the performance, even one exceptionally rude fellow in the front row. Still, different culture, different practices.